Increase in global production of oils and fats and demand for alternatives and value added ingredients across the food and beverages industry is expected to contribute to the revenue growth of the global specialty fats and oils market. Over the last few years, there has been significant growth in the global specialty fats and oils market owing to rising consumption of specialty oils in several industrial applications. Since the last few years, research in developing specialty fats and oils has increased significantly due to the growing demand for value added ingredients across the food and beverages industry. Shea and palm oil derivatives are the most common sources of cocoa butter alternatives. Researchers are working on creating novel and healthier alternatives ranging from mango seed to hump fat. Global specialty fats and oils market is primarily characterized by the presence of a large number of local and regional players. An approximate share of 40%-45% is accounted for by local players. Asia Pacific and Western Europe are the two main target regions due to increasing demand for alternative and healthier specialty fats and oils in these regions. Countries such as Indonesia, China, EU-28, and Malaysia are the largest producers of specialty oils and fats globally. The demand for coconut oil has been decreasing across the globe. Particularly in the U.S. the popularity of coconut oil is declining fast, leading to a reduction of revenue in the North America market for specialty fats and oils. This remarkable reduction in the consumption of coconut oil is associated with the rising health conscious population particularly in North America which is responsible in hampering the growth of the global market for specialty fats and oils during the projected period. Due to uncertain weather conditions and political instability, the prices of oil crops are unstable thereby impacting the oil output from oil crops growers, which in turn is restraining the oil supply to manufacturers. Other key factors attributed to reduced production volumes of specialty oils across the globe are limited access to finance and lack of knowledge about modern farming techniques and farm management skills. It is estimated that around 30%-40% of crops in major producing regions are lost due to improper pest and crop disease control procedures. Land available for the production of major oil producing crops are limited as agriculture land availability in the Asia Pacific is witnessing a rapid decline. This factor is adversely affecting the overall growth of the global specialty fats and oils market. The declining agricultural land availability can be attributed to a drop in the agricultural workforce due to the growing urban population. 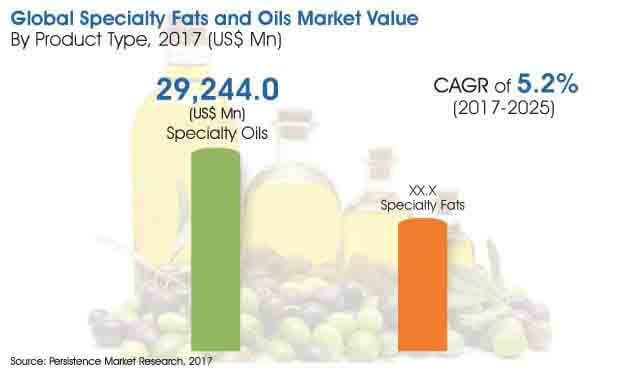 In terms of value, the specialty oils segment is projected to be the most attractive in the global specialty fats and oils market during the period of assessment. The specialty oils segment accounted for a relatively high value share of 76.0% in 2017 and is anticipated to register a CAGR of 5.2% in terms of value over the forecast period.